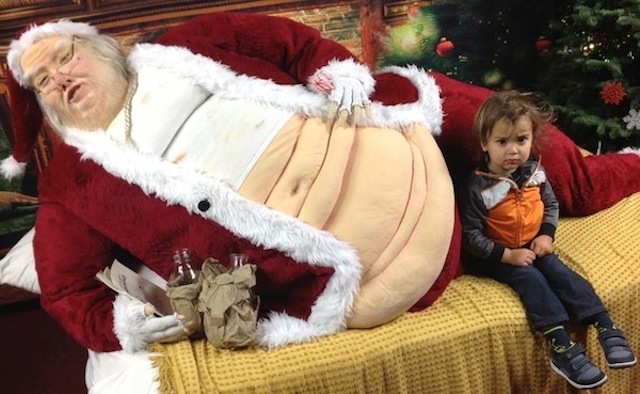 This season Betabrand, famed and defamed for their creation of the Suitsy (a onesie suit) has reprised their holiday horror photo scene starring Santa the Hutt. Passersby at the Valencia Street store are encouraged to stop in, sit on (well, near) Santa the Hutt's lap for a photo, and then buy a sweater that looks like a disco ball. P.S. It's a doll, not a live person. The Star Wars/Santa mashup this year seems to have maintained about the same weight, but he's now adopted a more becoming posture  fewer rolls, though less obvious Jabba parallels. He also appears to be laying off the booze (see below from last year). Oh, he washed his T-shirt, too.